I read & accept the notes about width design. I am 100% Clear. I read & accept. 4) Don't get dizzy with all of our NEW font choices!!! 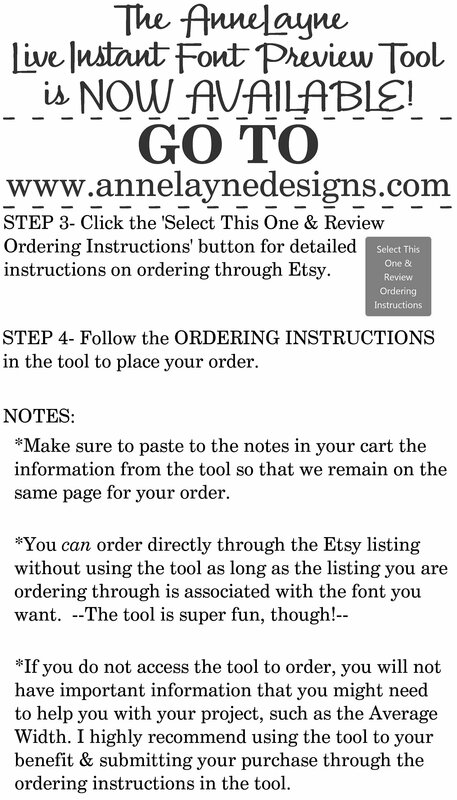 You will now use our new tool at www.annelayedesigns.com to help you with ordering. 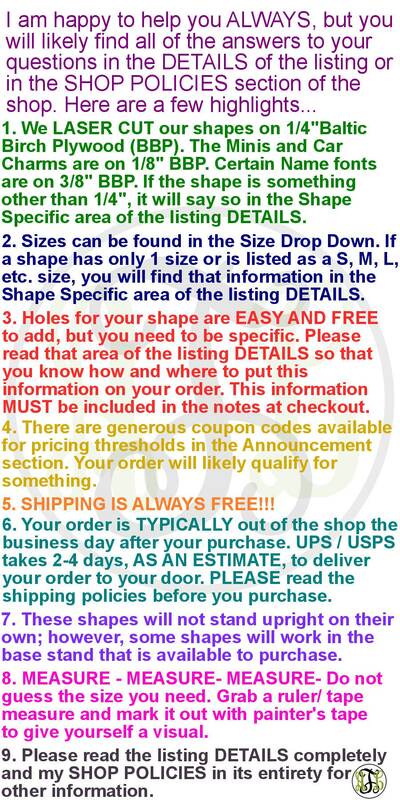 It will redirect you back to a Generic Listing to make your selections on Etsy. You will add to cart as usual, and you will paste the information from the tool into the special instruction notes box at checkout. The tool is impressive, if I may say so myself...and addictive...so be careful not to have too much fun! 6. 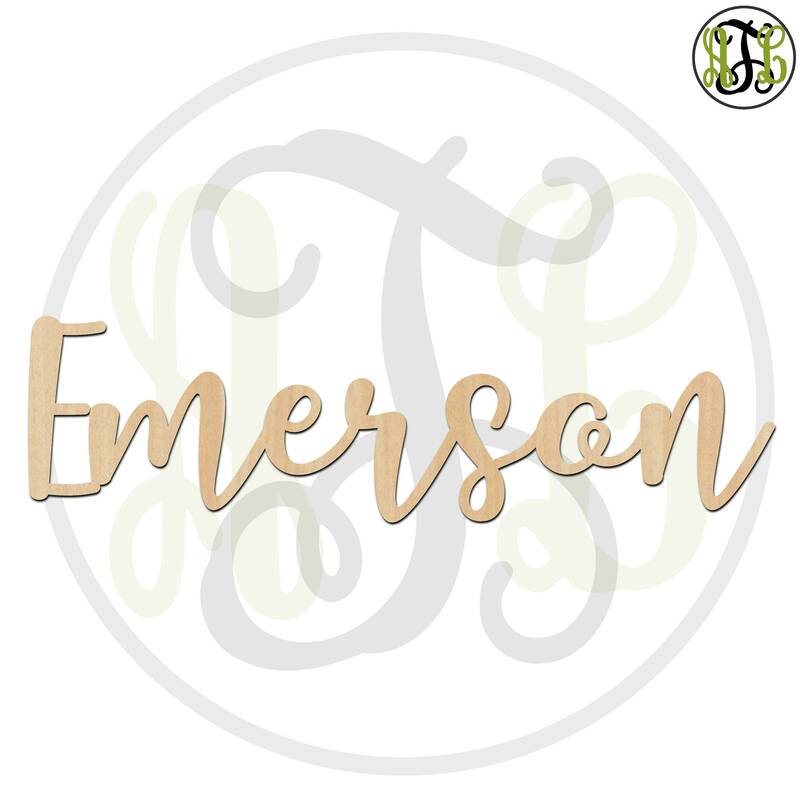 The Tool will Display Your Name/Word/Phrase in the Selected Font, and Provide You with the Number of Letters, Approximate Width Range, Average Width, and the Etsy Price for Your Selected Height. For each change of Steps 1-4, hit the 'Calculate...' button to see your Width Values and Price. 7. Once you have settled on a Font and Height, Click 'Select This One & Review Ordering Instructions'. 8. On the instruction page, click the appropriate radial button, and select the 'I understand' box. 9. 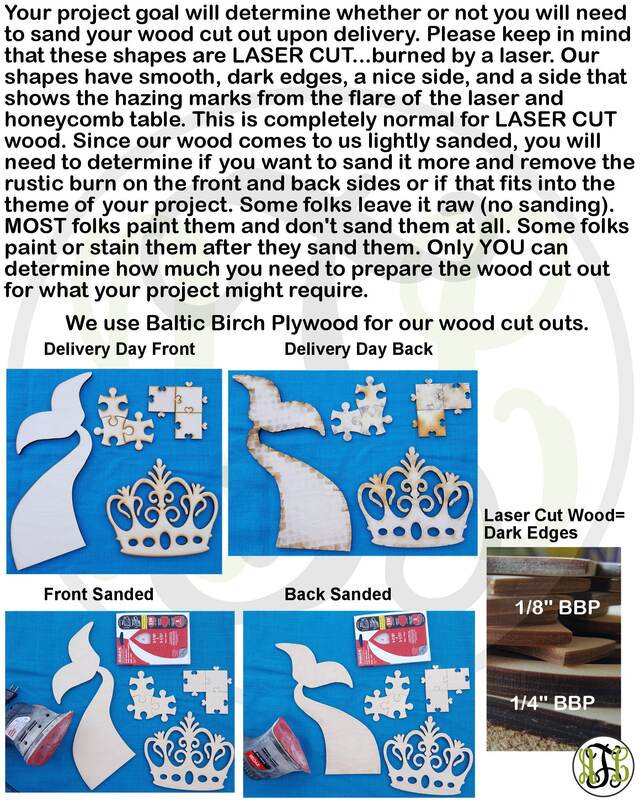 You will click 'Copy to Clipboard and Continue to Order', and you will be redirected to the Generic Listing (shown in the photos above) to place your order. 10. Make your selections in that listing, and click 'Add to cart'. 11. --IMPORTANT--→Paste into the notes at checkout, and your selections from the tool will appear there!←--I will need this information as the Generic Listing has NO font associated with it. 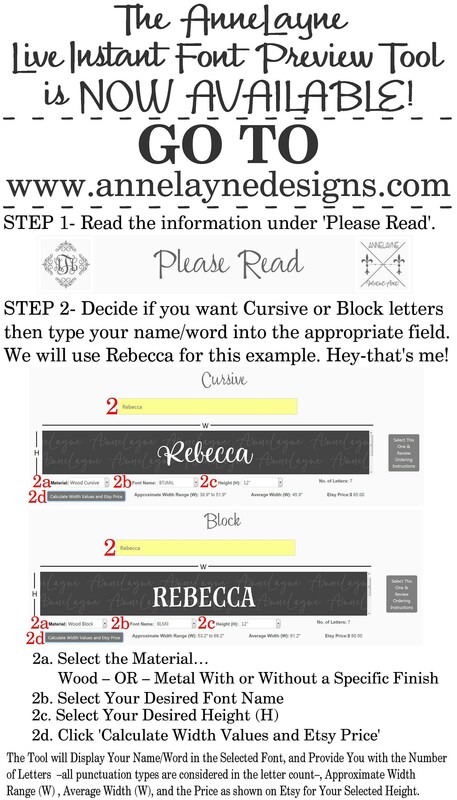 The information that you give me from the tool will be what I use to design your name / word. You can compare up to 8 Fonts at a time (2 Cursive, 2 Block, & 4 Mixed Fonts in the Phrase Section). This Tool is Great for Selecting Font Options for Custom Names and the Name Kits. It is also a great tool to see the layout and fit of word signs on a backdrop (Phrase Section). Once you know your dimensional limitations of your backdrop, you can use the Phrase Section as a gauge for how your phrase will fit on your backdrop according the the width values it will calculate at your chosen height. You can play with your words in any font you like. When you are done, you will add EACH name / word of your phrase to the cart individually at the SAME height and according to the number of letters in each. Event Planners will love this!! 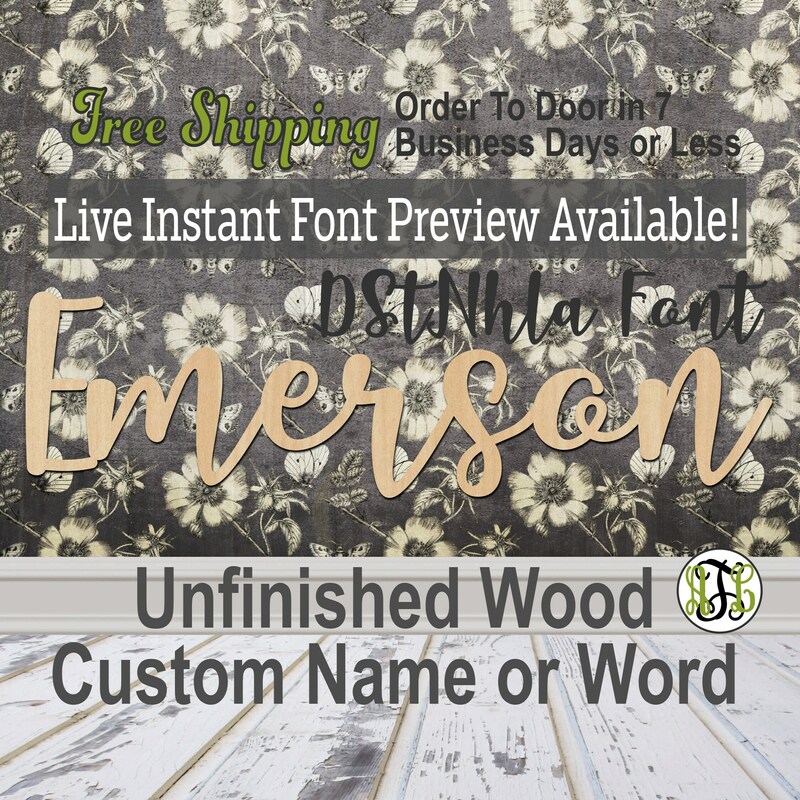 ●1● I have more fonts in the tool than listings in my shop, so purchasing your name/word/phrase will be directed to THIS Generic Custom Name or Word Sign Listing. You will make your 'Height & No. of Letters' selection and select your 'I understand about width design' here as usual. 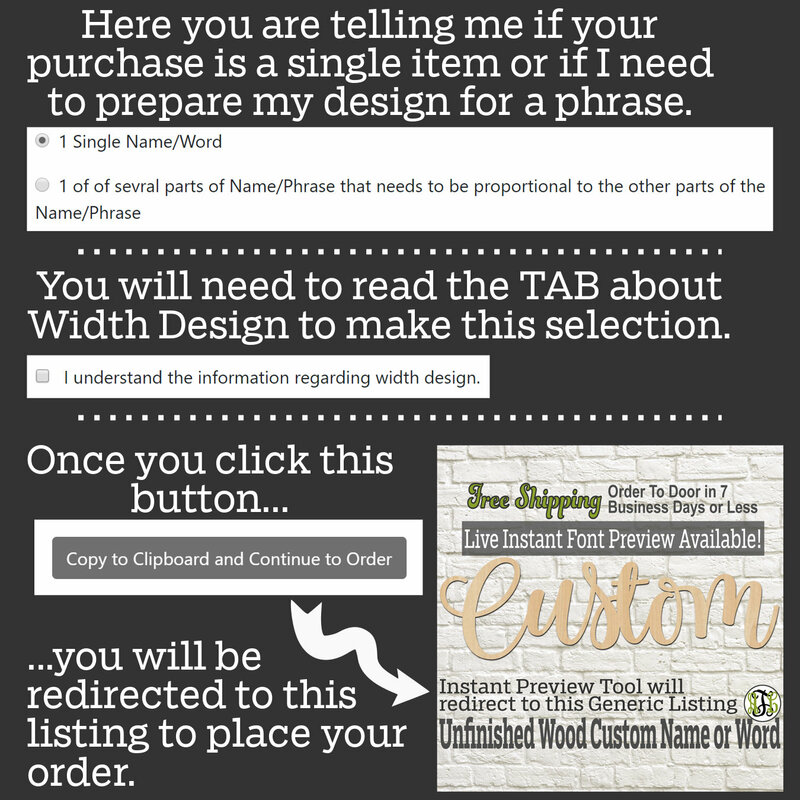 As long as you click the ‘Copy to Clipboard…’ and paste it in the notes when you checkout on Etsy, I will have your desired selections when you make your purchase as your selections from the tool will be pasted there. ●2● The Height is from the bottom most point to the top most point of your name/word/phrase. ●3● Any letter showing to be unattached to the rest of the word (or where parts of the letter are not attached to itself), will be joined to the rest of the word (or the rest of the letter structure). ●4● The dot for the ‘i’ and ‘j’ will be attached to the stem unless we are instructed not to do so in the notes at checkout. ●5● Some fonts are thinner than we like to cut, so we will make them bolder. Sometimes, that means small hoops and loops will be closed. ●6● The Approximate Width Range shown in this tool is a close approximation. The image you see in the tool is not in it’s completed form until I remove all unnecessary spaces. ●7● If you are looking to reach a --WIDTH LIMITATION-- rather than HEIGHT, change the Height until the Average Width is what you need. Order 1 size up if the odd number gives you the width you need, and put in the notes at checkout the width you need for your project. If the HEIGHT shown for the width you need is an ODD number, it will not be listed in the shop. You will need to order 1 size up. In the notes at checkout, tell me your desired WIDTH and NAME/WORD for your item. The HEIGHT will scale proportionally at YOUR DESIRED WIDTH given in the notes at checkout. In this example, you can choose Quantity 3 for the 8"H - 3 Letter option when adding to your cart for 'you', 'now', & 'and'. Each word WILL NOT BE 8"H. Height sizing is from the lowest point of your ENTIRE STRING OF WORDS...in this case, it is 'Always', and the rest of the words are scaled appropriately. 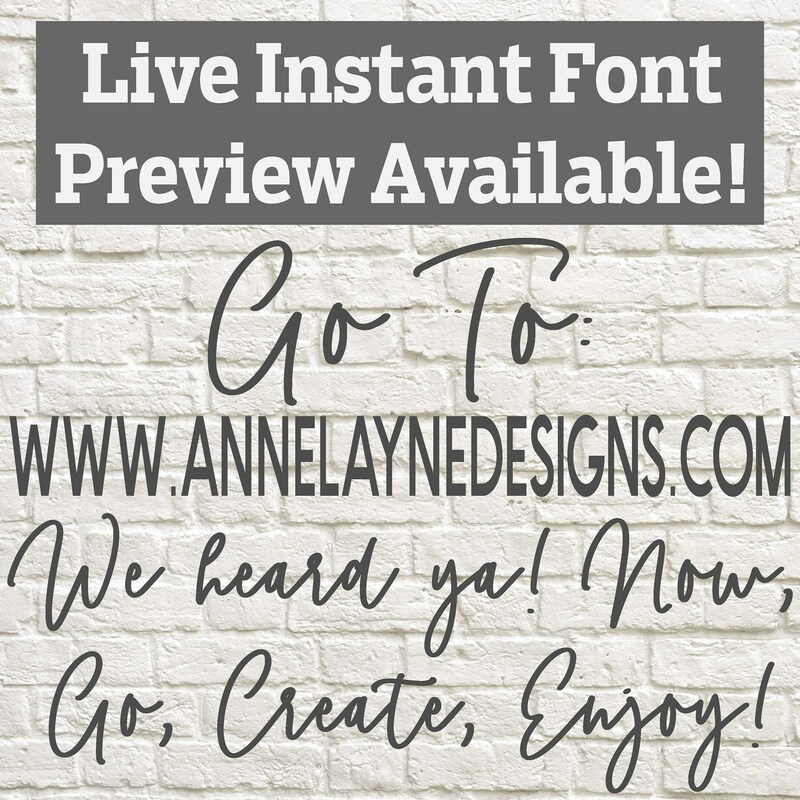 You can use the Phrase feature in the Preview Tool at www.annelaynedesigns.com to get an idea of your layout and the WIDTH of your entire phrase at your desired height. 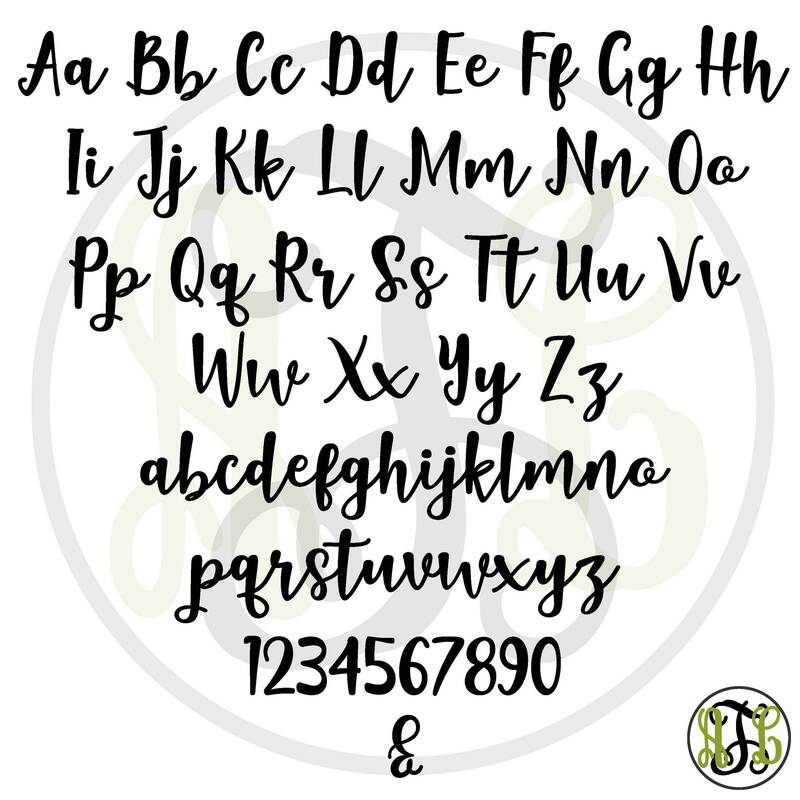 ●9● These are priced for all lowercase letters or 1-2 Capital Letters and the rest lowercase letters. Names with ALL CAPITAL LETTERS typically produces a vastly larger item and will need to be purchased via a private listing.